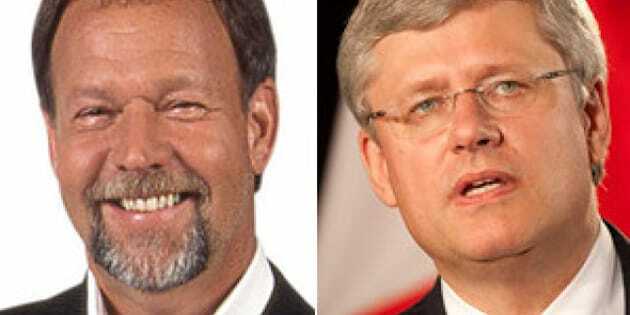 Well-known Canadian pundit and former Progressive Conservative pollster Allan Gregg delivered a scathing critique of the the Conservative government under Stephen Harper in a speech at Carleton University last week in Ottawa. Titled "1984 in 2012 – The Assault on Reason," the speech was given at an event to celebrate the move of Carleton's Faculty of Public Affairs into a new building. In the address, Gregg draws parallels between the "nightmarish future" envisioned by George Orwell in his famous novel "1984" and the attitude displayed by the Conservatives in the present toward scientists, environmentalists and public servants. The speech quickly went viral on social networks, accumulating thousands of shares. Gregg is perhaps best known as a former regular on CBC's political At Issue panel on "The National." His resume, however, goes on and on. He is chairman of the polling firm Harris Decima and served as a pollster and advisor to the PCs under Brian Mulroney and Kim Campbell. He was also a founding shareholder of the TV network YTV and has served as Chairman of the Toronto International Film Festival. He even founded a record label, The Song Corp., and has worked with the Tragically Hip, The Watchmen and Big Wreck. You can read the complete text of Gregg's speech below the slideshow. Throughout history there has been a need to explain the unexplained. And for the greatest part of history, the bulwark against not-knowing has been superstition, dogma and orthodoxy. Can’t explain droughts? Blame God’s wrath. Why are we suffering from mysterious diseases? Witchcraft. And of course, economic downturns could be blamed on ethnic minorities. The response to these beliefs has been human sacrifices, burning at the stake and ethnic cleansing. This is the linkage that Voltaire made when he wrote … “those who can make you believe in absurdities can make you commit atrocities”. Understanding the world or explaining phenomena through superstition, dogma and orthodoxy – instead of facts and reason – invariably leads to some very ugly and uncivilized behaviour. The reason for this is fairly straightforward – namely, beliefs that are rooted in superstition, dogma and orthodoxy are not sustainable … sooner or later their veracity will be tested by facts and evidence. Those who need these beliefs to sustain their interests and power therefore must enforce at the point of a sword or remove those who might prove them to be untrue. Orwell’s claim that “Ignorance is Strength” might have been the clever writing of a satirist at the height of his talents but it was also much more than that. It is his most dire warning. Abolitionist and newspaper publisher Fredrick Douglas said that it was illiteracy more than the lash that gave slaveholders power over black men and women. Orwell was making a similar point… the suppression of knowledge and reason is the tyrant’s most powerful tool… and the greatest threat to freedom. “Orthodoxy,” he said, “means not thinking – not needing to think. Orthodoxy is unconsciousness”. Of course, the opposite is also true. The greater the knowledge and education of a population, the more difficult it is to oppress them. As Steven Pinker notes in his new book “The Better Nature of our Angels” … “The subversive power of the flow of information and people has never been lost on political and religious tyrants. This is why they suppress speech, writing and associations and why democracies protect these channels in their bills of rights” (p. 179). In fact, in a triumph of his own research and command of reason, Pinker makes a compelling case that the hallmark of modern history has been a progressive decline in violence, accompanied by a steady upward trajectory of civilized, humane and peaceful behaviour. More than anything else, it has been the embracing of reason and enlightened thinking that has moved civilization forward. In his 2007 best seller, “The Assault on Reason”, Nobel Prize winner and former Vice- President Al Gore made his own case for the protection of reason as the foundation of democracy. The basis of his argument is that the marketplace of ideas is open to all and the fate of those ideas is based on their merit (rather than birthright or finance). In this sense, reason reinforces equality. Moreover, when we engage in public debate, armed with reason, by definition, we are prepared to compromise and find common ground with those who might otherwise be our opponents. In this way, conflicts between individuals are resolved through words and ideas rather than the barrel of a gun. In the same way, it was only when ordinary citizens began to govern themselves using common sense, logic, and the best available evidence, that governments began to change and evolve without resorting to raw power and violence. So it is important to remind ourselves why we value reason and why we should be very concerned when it comes under assault. Pinker, like others, notes that democracies rarely, if ever, declare war on one another anymore and that the idea of one nation invading another to control sovereign territory has virtually become an anachronism. He explains the line between democracy and peace in this way … “Democratic government is designed to resolve conflict through consensual rule of law and so democracies .. externalize this ethic in dealing with other states. Also, every democracy knows the way the other democracies work, since they are all constructed on the same rational foundation rather than growing out of a cult of personality or messianic creed or chauvinistic mission” (p. 278). This mutual trust between democratic nations therefore mitigates against the need for any pre-emptive strike against one another. And as important as peace and democracy are, reason also leads to a series of other beliefs and behaviours we now associate with our prosperity and fortunes. Reason has taught us that it is cheaper and more efficient to enter into a commercial arrangement with our neighbours than to invade, plunder or colonize them. Trade of goods and services between nations, in turn, inflates and widens our empathy beyond kin and tribe and encourages immigration and pluralism. Beyond empathy, science has revealed that all races and peoples share common traits and therefore deserve to be treated equally. This humanism and the placement of the rights of the individual on an even plane, above the rights of states, draws us inevitably towards concepts such as the responsibility to protect. While the scriptures might tell us we are all each other’s keepers, it is reason that compels us to behave in this way. In fact, our entire notion of progress has reason at its core. As Ronald Wright reminds us in his brilliant lecture series, “A Short History of Progress”, this is a relatively modern concept. For most of civilization, people believed their station in life would be pretty much the same when they died as when they were born. And they believed this because it was true – mortality, health and wealth improved little for most of human history. It was only when we began to imagine that man and society was, if not perfectible, certainly improvable, that optimism and scientific endeavour sought to propel mankind forward. And more than anything else, societal progress has been advanced by enlightened public policy that marshals our collective resources towards a larger public good. Once again it has been reason and scientific evidence that has delineated effective from ineffective policy. We have discovered that effective solutions can only be generated when they correspond to an accurate understanding of the problems they are designed to solve. Evidence, facts and reason therefore form the sine qua non of not only good policy, but good government. I have spent my entire professional life as a researcher, dedicated to understanding the relationship between cause and effect. And I have to tell you, I’ve begun to see some troubling trends. It seems as though our government’s use of evidence and facts as the bases of policy is declining, and in their place, dogma, whim and political expediency are on the rise. And even more troubling …. Canadians seem to be buying it. Again, as someone who had used the census – both as a commercial researcher and when I worked on Parliament Hill – I knew how important these data were in identifying not just toilet counts, but shifting population trends and the changes in the quality and quantity of life of Canadians. How could you determine how many units of affordable housing were needed unless you knew the change in the number of people who qualified for affordable housing? How could you assess the appropriate costs of affordable housing unless you knew the change in the amount of disposal income available to eligible recipients? And even creepier, why would anyone forsake these valuable insights – and the chance to make good public policy – under the pretence that rights were violated when no one ever voiced the concern that this was happening? Was this a one-off move, however misguided? Or, the canary in the mineshaft? Then came the Long Gun Registry. The federal government made good on their promise to dismantle it regardless of the fact that virtually every police chief in Canada said it was important to their work. Being true to their election promises? Or was there something else driving this decision? Then, came the promise of a massive penitentiary construction spree which flew directly in the face of a mountain of evidence indicating that crime was on the decline. This struck me as a costly, unnecessary move, but knowing this government’s penchant to define itself as “tough-on-crime”, one could see – at least ideologically – why they did it. But, does that make it right? Then came the post-stimulus federal budget of 2012 which I eagerly awaited to see if there would be something more here than mere political opportunism. It was common knowledge that this government had little stomach for the deficit spending that followed the finance crisis of the previous years. And knowing that the public supported a return to balance budgets, it was a foregone conclusion that we were going to be presented with a fairly austere budget document. That the government intended to cut 19,000 civil servant jobs – roughly 6% of the total federal workforce – might have seemed a little draconian, but knowing what we knew, not that shocking. As part of this package, it was also announced that environmental assessments were to be “streamlined” and that the final arbitration power of independent regulators was to be curtailed and possibly overridden by so-called “accountable” elected officials. Again, given the priority this government places on economic, and especially resource development, this was not necessarily unpredictable either. But when then the specific cuts started to roll out, an alarming trend began to take shape. - First up were those toilet counting, privacy violators at Stats Canada – ½ (not 6%, but 50%) of employees were warned that their jobs were at risk. - 20% of the workforce at the Library and Archives of Canada were put on notice. - CBC was told that it could live with a 10% reduction in their budgetary allocation. -In what was described as the “lobotomization of the parks system” (G &M – May 21, 2012), 30% of the operating budget of Parks Canada was cut, eliminating 638 positions; 70% of whom would be scientists and social scientists. -The National Roundtable on the Environment, the First Nations Statistical Institute, the National Council on Welfare and the Canadian Foundation for Climate and Atmospheric Science were, in Orwell’s parlance, “vaporized”; saving a grand total of $7.5 million. -The Experimental Lakes Area, a research station that produced critical evidence that helped stop acid rain 3 decades ago and has been responsible for some of our most groundbreaking research on water quality was to be shut down. Savings? $2 million. The northernmost lab in Eureka, Nunavut awaits the same fate. - The unit in charge of monitoring emissions from power plants, furnaces, boiler and other sources is to be abolished in order to save $600,000. - And against the advice of 625 fisheries scientists and four former federal Fisheries Ministers – saying it is scientifically impossible to do — regulatory oversight of the fisheries was limited to stock that are of “human value”. - To add insult to injury, these amendments was bundled in with 68 other laws into one Budget Bill, so that – using the power of majority government – no single item could be opposed or revoked. - On the other side of the ledger however, the Canada Revenue Agency received an $8 million increase in its budget so that it had more resources available to investigate the political activity of not-for-profit and charitable organizations. Ok, so now the facts were beginning to tell a different story. This was no random act of downsizing, but a deliberate attempt to obliterate certain activities that were previously viewed as a legitimate part of government decision-making – namely, using research, science and evidence as the basis to make policy decisions. It also amounted to an attempt to eliminate anyone who might use science, facts and evidence to challenge government policies. And while few in the popular press at home belled the cat quite this squarely, the pattern did not go unnoticed in other quarters. The editorial in the March issue of Nature criticized the Harper Government for muzzling and tightening the media protocols applied to federal scientists. Two weeks earlier, the Canadian Science Writers Association, The World Federation of Science Journalists and others send an open letter to the Prime Minister calling on him stop suppressing scientific findings and let them be freely shared, in keeping with the best practices of the discipline. And in July, in an unprecedented demonstration, lab-coated scientists marched on Parliament Hill to protest what they viewed as a systematic attack on evidence-based research by this Government. In 1984, the abandonment of reason is twinned not simply with unthinking orthodoxy but also by the wilful dissemination of misinformation. Orwell makes this point in part by using ironic names for various government departments: the Ministry of Love is responsible for war. The Ministry of Plenty is tasked with parsing rations. Again if this is satire, I can pretty much guarantee that Orwell’s intent was savage. Written in the shadow of the war, Orwell had seen this kind of misdirection used to mask evil intents, in real time and in real life. When Hitler circumvented the German Parliament and seized power in 1933, he did so under legislation named “The Law to Remedy the Distress of the People”. When the horrors of the holocaust were revealed, they were accompanied by the unforgettable image of the gate into Auschwitz with its Orwellian slogan “Work Will Set You Free”. And today, more and more, we see this same kind of misdirection and news speak in the behaviour of our legislators. A quick review of the some of the Bills passed or on the order paper of this session of Parliament gives you the sense that this government might have studied under Orwell. Bill C-5 is entitled “The Continuing Air Service for Passengers Act”. Substantively, it offers no such guarantee but unilaterally extended the contract of the National Automobile, Aerospace, Transport and General Workers Union of Canada and removed any prospect of a lockout or strike. Bill C-10 is “An Act to Enact the Justice for Victims of Terrorism” and sub-titled “The Safe Streets and Communities Act”. Again forgetting for a moment that there are more victims of swimming pool drowning than terrorism, this is an Omnibus Bill which, among other things, stiffens penalties for possession of pot and builds more prisons. Bill C-18 is called the “Marketing Freedom for Grain Farmers Act”. It dismantled the Canadian Wheat Board. Bill C-26 boasts that it is “The Citizens Arrest and Self-Defense Act” and it is the closest we come in Canada to replicating Florida’s odious Stand Your Ground legislation. The purpose of Bill C-30 is stated to be “The Protect Children from Internet Predators Act” and it, among other things, forces ISPs to hand over their user names to police without a warrant. When opponents protested this deliberate obfuscation, Safety Minister Vic Toews famously countered that “you are either with us or the child pornographers”. The thing that is disconcerting and unsettling about all this is not just the substance of these Bills, but why a government would want to disguise that substance. Maybe dismantling the Wheat Board; or pre-emptively squashing collective bargaining; or sending more potheads to jail is a good thing. But before we make those decisions, let’s look at all the facts; have a fulsome and rational debate; and make a reasoned decision of what is in the best interests of all the parties involved. For voters to determine whether these are measures they support or oppose requires that they know what is at stake and what the government is actually doing. Moreover, for the rule of law to work, the public must have respect for the law. By obfuscating the true purpose of laws under the gobbledy-gook of double speak, governments are admitting that their intentions probably lack both support and respect. Again, the lesson here is Orwellian … in the same way that reason requires consciousness, tyranny demands ignorance. Raising this is not a question of right versus left. It is rather- in the words of Al Gore – a question of right versus wrong. And also make no mistake that this is not simply an attack on, or a claim that the sole practitioner of masking intent is The Harper Government. Jean Charest, introduced Bill 78 as “An Act to Enable Students to Receive Instruction from the Post Secondary Education They Attend”. Under some fairly benign circumstances, it basically bans the freedom of assembly. And under the pretext of another perpetual war – the so-called War on Terrorism – the President of the United States not only routinely orders the execution of foreign nationals, on foreign soil, without any semblance of due process whatsoever, but boasts that this as one of the greatest accomplishments of his Presidency. And the American media routinely applauds him for it. Now I know it’s not comfortable to offer suspected terrorists due process, but isn’t this exactly the kind of behaviour Orwell was warning us about? Having conceded this, I DO believe that this particular government is pursuing a not-so-hidden agenda. It starts with the premise that the Canadian political pendulum has over swung in the direction of liberalism – that the political agenda and discourse of this country, for too long, has been hijacked by urban elites who do not represent the voice of hard working men and women who live in the burbs, shop at Canadian Tire and take their kids to the hockey rink every week. And I DO believe that Stephen Harper and his colleagues have set out to systematically right what they see as this wrong. This view holds that parks are for tourism and campers, not for the flora and fauna that must be protected by scientists. Policy should be based on conviction and not bloodless statistics. Governments should be guided by what is morally right and not by reason and rational compromise. From this view, science, statistics, reason and rational compromise are not tools of enlightened public policy, but barriers to the pursuit of swing that pendulum back. The problem is, notwithstanding a fairly widespread consensus around the orthodoxies of balance budgets, market economies and open trade, Canadians, by and large, still believe in tolerance, compromise, egalitarianism. We tend to see ourselves as each other’s keeper with a responsibility for those who are less fortunate. So to realize this agenda, it becomes necessary to pursue it by stealth and circumvention rather than through transparency and directness. This too explains the apparent obsession with secrecy, message control and misdirection. But even if you accept this thesis, it still begs another question …. if Canadians are essentially enlightened liberals, and are not prepared to offer wholesale buy-in to this vision of politics and the nation, why do we not hear a hue and cry in protest over the direction we are being led? At root, I think a big part of the problem is cultural. For decades following the Second World War, a progress ethos dominated North American thought. The next car was going to be faster, the next paycheque fatter and the next house bigger. This notion that progress was both normal and limitless, generated a series of beliefs that were universally embraced. Anyone of my generation will remember being told … “You my child, deserve more than I had when I was growing up”…. “If you work hard and put your mind to it, you can be anything you want” … and “A good education is the key to success”. This value system – and an experience that closely corresponded to it – created not only a sense of well-being but also a sense of good will. If the prospects of progress and success were limitless, then whatever success you enjoyed in no way threatened the amount of success that might be available to me. Today – in sharp contrast – we seem to be living in a zero sum society, where the prevailing wisdom is that the rich are getting richer while the poor or getting poorer; that whatever prosperity might be available is being unequally shared; and for many, opportunity is actually shrinking. In the same way that feelings of well -being can generate good will, feelings of threat spawn envy and recrimination. This not only explains the anger of the Occupy Movement or the students protesting in the streets of Montreal but also the disdain that the middle class has for “pampered” public sector employees or the excessive obsession the rich seem to have about the poor “ripping off the system”. Once the population starts to segment itself into “us versus them,” anyone with a vested interest in exacerbating the rift can easily till that soil. And that is clearly what is happening in the political process today. On one hand, political parties no longer see the need to reach out and expand their base beyond their core constituency, because their core constituency is often at odds with the voters whom they otherwise might want to attract. To the contrary, it makes more sense to vilify these voters, as a way to motivate your core. A vicious cultural wheel therefore is turned by a political one. A fearful, divided citizenry fights off uncertainty by protecting its own turf; politicians exploit this division by choosing sides and offering simplistic solutions to address these fears; and the population seeks solace in the simplistic solutions. So instead of trying to bridge these differences through consensus and finding compromise based on reason, what we see all too often today is the politics of polarization, over-torqued partisanship and dogma. What the f**k? As if the two are mutually exclusive? As if healing the planet means you can’t help families? Or that helping families means ignoring the planet? Yet this was the biggest applause line of his entire speech. I guess for many, when you fear for your family, it is comforting to think that all you have to do to protect them is ignore rising ocean levels and everything will be alright. Once again, in the most perverse way, Orwell was right … Ignorance can feel like strength. Many – from Noam Chomsky, to Neil Postman to Al Gore – have also laid the blame on the media. Either through sloth, sensationalism or the very pacifying nature of the medium itself, a culture saturated in trivia has become anesthetised to the larger needs of the world in which we live. Indeed, as Chris Hedges asks in his brilliant screed, The Empire of Illusion, when we come to believe that we are all only one audition away from celebrity, why concern yourselves with picayune problems like the homeless, let alone some arcane concept like the assault on reason? Most of this analysis however has been limited to the effect of television – the equivalent, of the ubiquitous telescreens of Orwell’s 1984. But instead of monitoring citizen activity, media today portrays an outside world that often in no way reflects reality beyond the sensational, the trivia and the pacifying. But for whatever role television may have played in amusing ourselves to death in the past, we now live in a digital world where there is “evidence” for every and any view one might want to embrace. If I believe the world is flat, the internet now puts me in touch with legions of fellow flat earthers and reams of pseudo science to support that belief. As importantly, if I am so inclined, I never have to be exposed to any contrary views and can find total refuge in my community of flat earthers. The Internet therefore, offers me the opportunity to have a completely closed mind and at one in the same time, fill it full of nonsense disguised as fact. In a brand new way therefore, the internet democratizes not just individual opinion but legitimizes collective ignorance and spreads a bizzaro world of alternative reason. When this occurs, prejudice and bias is reinforced and the authority of real science and evidence is undermined or even more likely, never presented. But it doesn’t have to be this way. History shows us that, over time, science’s authority always undermines dogma’s legitimacy and the persuasive power of reason will always trump ideology’s emotion. It’s true that if you want to follow a course based on dogma or ideology, it becomes necessary to remove science and reason. But the corollary also holds true – the best defense against dogma and ideology continues to by reason and science. And if it’s increasingly hard to find these qualities in the media or the political process, what better place to take a stand than in a University? This is where you come to seek intelligence; not belittle it. Where ideas are born; questions are asked; and thoughts collide. This is why so many have fought so long to protect academic freedom – to ensure that reason, inquiry and science cannot be assaulted by dogma and orthodoxy. While the circumstance in Canada 2012 is obviously nowhere near as dystopian as what Orwell depicts in 1984, I really do think that there are some unsettling parallels going on here that we ignore at our peril. I also think it’s time to gather the facts….and fight back.